There are days when my mind just goes blank thinking about the next meal or even the next two meals, about what to cook! Sometimes, I crave for something really spicy, but then would have to prepare an additional dish which my kids can have as well. I have been away from spicy food for a few weeks now, and the craving is back here again! This dish is perfect for the whole family. While this is not what I would call spicy, nevertheless, it seems to satisfy my craving for something spicy. The aroma of this dish while it is cooking, is just awesomely good. This dish uses the roots and tender stems of the coriander plant, did you know that the roots can be eaten? It is usually used in curry dishes like this, and it is even more fragrant than the leaves! Just soak the roots for a few moments and rub them gently. I love corianders, they have a distinct beautiful aroma and great in most dishes, like Chinese stir-fries and wonderful as a garnish. Give this a try, I'm very sure that you will enjoy this dish. We had this with plain white rice, though I'm sure it will be really good with any briyani rice. My bloggie pal, Mom's Sunday Cafe is having a COOKBOOK SUNDAY on the first Sunday of the Month, which will stay open for a week. This is a fun blog hop and a great way of sharing with other bloggers who have something in common, that is, cooking and baking from our many cookbooks! If you are baking or cooking from any cookbooks, please do join in the fun. You can even link your favourite cookbook recipes from your previous posts. For more information on COOKBOOK SUNDAY, please visit Mom Sunday Cafe. Hope to see you there. First make the curry paste. Place all the ingredients in a large mortar or food processor and pound with a pestle or process to a smooth paste. Heat the vegetable oil in a wok, add the garlic and cook over low heat, stirring frequently, until golden brown. Be careful not to let the garlic burn or it will taste bitter. Add the curry paste to the pan and cook for a further 30 seconds, stirring constantly. Add the chicken pieces to the pan and stir until they are thoroughly coated with the curry paste. Stir in the fish sauce and chicken stock, then add the sugar, and cook, stirring constantly, for 2 minutes moe. Add the lemon grass and lime leaves, reduce the heat and simmer for 10 minutes. Spoon the curry into four warmed dishes, garnish and serve immediately. Another winning recipe from Rachael Ray! This is a delicious burger with a fantastic sauce and a wonderful drizzle! I had this for dinner on the weekend as it was only me and the kids. It does take a little extra work but they are simple and the end result is just fabulous! I first saw this gorgeous burger from Brenda's Canadian Kitchen, before I bought Rachael's book Look+Cook, and I knew that I will make this sooner or later. This delicious burger together with homemade buns makes a satisfying meal! This bun recipe is from one my favourite site, King Arthur Flour. Again, the first time I came to know of this recipe from Brenda's Canadian Kitchen! (Hi Brenda! thanks!). As what Brenda says, and I totally agree, you will never buy buns from the store again! This is the best burger bun there is! It is soft and everything what a burger bun should be. Buying burger buns from the bakery will only be a last resort for me now! I have bought burger buns from the bakery before and it is not always fresh and soft. Read all the great reviews of this bun here. I'm submitting this to Aspiring Bakers, hosted by The Sweetylicious where the theme for the month of June is "Bread Seduction". * For best results (a smooth, slightly soft dough), use the smaller amount of water in summer (or in a humid environment), the greater amount in winter (or in a dry climate), and something in between the rest of the time. Cover the dough, and let it rise for 1 to 2 hours, or until it's nearly doubled in bulk. (My dough took about an hour). Bake the buns in a preheated 375F oven for 15 to 18 minutes, until golden. Remove them from the oven, and brush with the remaining melted butter. This will give the buns a satiny, buttery crust. Sirloin Burgers with Garlic-Black Pepper-Parmesan Sauce & Roasted Tomatoes with Basil & Balsamic Drizzle. That's a long name for a burger! This burger does take a little extra steps to prepare, but it is worth the effort. I used ground pork instead of ground sirloin. While the burger itself is just seasoned with a little salt and pepper, the sauce and drizzle is just fantastic. The sauce is prepared by cooking the milk, garlic, and black pepper with a little flour until thickens and the cheese is stirred in. Really good! The balsamic vinegar is cooked by mixing with a little brown sugar and boils until thick and syrupy. This makes a lovely drizzle on the burger. If you are a burger fan, this is a must-try! Thick slices of ripened tomatoes are drizzled with olive oil, season with a little salt and pepper, and baked in the oven for 45 minutes until caramelized! Beautiful! Delicious burger. We did top it up with more lettuce, lovely! Preheat the oven to 325F. Place a cooling rack over a rimmed baking sheet. Arrange the tomatoes on the rack, then drizzle with a touch of EVOO and season the tomato slices with salt and pepper. Roast the tomatoes for 45 minutes, or until tender and caramelized. Set aside. When the tomatoes are about ready, place a large skillet over a medium-high heat with the 2 tablespoons of EVOO. While the pan is heating up, combine the sirloin with some salt and pepper. Form the mixture into 4 patties thicker at the edges and thinner in the centre for even cooking and to ensure you end up with a flat burger (the burgers will bulge up during cooking). Cook the patties for 10 minutes for medium-rare, turning once. Cook for 12 minutes for pink centers and 14 minutes for well-done. While the patties are cooking, place a small pot over medium heat with the butter. Add the garlic to the melted butter and cook for about 1 minute. Add the flour to the pan and cook for 1 minute more. Season with salt and the coarse black pepper. Whisk the milk into the butter-flour mixture and bring up to a bubble. Simmer until the sauce is thickened, about 2 minutes. Stir in the grated cheese. Prepare a balsamic drizzle in a small pot if not using store-bought. To assemble, place some lettuce on each bun bottom and top it with a burger patty. Pour garlic-black pepper-parmesan sauce over the top, set the roasted tomatoes in the sauce, scatter basil over the tomatoes, and garnish with balsamic drizzle. Set the bun tops in place and serve. This is so delicious! Downright yummy! I bought this book "Pastry Cook" by Catherine Atkinson more than a year ago and have constantly going through this book, with "delicious plans in my head" of making this and that each time I opened this book, but have never tried anything from it, that is, until now! This is a beautiful, gorgeous book to own, the colourful pictures are stunning and there are a few pictures for every recipe! My favourite kind of cookbook! Don't you just love cookbook full of pictures? This Cheese and Onion Quiche is so delicious, my kids have asked me to make this again. I even have to quickly reserve a slice for my hubby to try when he comes home from work before it all disappears! The recipe says this serves 6 to 8, but if you have hungry kids around, it will only serves 4! According to the recipe, bacon is an option, well in my house, this does not apply! :) It is so tasty with the bacon, though I think that without it, it will be delicious too. And I use milk instead of cream. There will definitely be a repetition of this delicious quiche very soon in my kitchen! To make the pastry, sift the flour and salt into a small bowl. Rub or cut in the butter until the mixture resembles fine breadcrumbs. Add 45ml/3 tbsp of the water and mix to a firm dough, adding more water if required. Knead until smooth, wrap in clear film (plastic wrap) and chill for 20 minutes. Roll out the dough on a clean, lightly floured work surface and use to line a 23cm/9in loose-based flan tin (quiche pan). Press the pastry firmly into the sides and base of the tin and let it rise above the rim by about 1cm/1/2 in to allow for a little shrinkage during cooking. Prick the pastry base all over with a fork. Line the pastry case with foil and baking beans and chill again for about 15 minutes. Preheat the oven to 200C/400F/gas mark 6 with a baking sheet placed in it. Stand the flan tin on the baking sheet and bake blind for 15 minutes. Remove the foil and beans from the pastry case and return it to the oven for a further 5 minutes. Remove the pastry case from the oven and lower the oven temperature to 180C/350F/Gas 4. To make the filling, melt the butter in a large, heavy frying pan. Add the onion and chopped bacon, is using, and saute for about 10 minutes until the onion is soft and golden. Beat the eggs and the cream or milk together in a bowl. Add the grated nutmeg and seasoning to taste. Spoon the onion mixture into the cooked pastry case and evenly sprinkle over the cheese. Pour the egg and cream mixture slowly over the filling. Bake the quiche for 35-40 minute, or until the filling has just set. Remove from the oven, leave to cool, then gently ease the quiche out of the tin and transfer to a serving plate. (my notes : to check whether the filling is well seasoned, I just put a tablespoon of the egg and milk mixture into a corner of the frying pan (hold frying pan and tilt it) and cook until set, then taste it, add more salt and pepper if necessary before pouring it all on the filling. You would not enjoy a quiche which is not well seasoned! For dinner a few nights ago, I made Ina's Indonesian Ginger Chicken and Jamie's Broccoli With Asian Dressing, to go with plain white rice. Ina's Indonesian Ginger Chicken is really easy and simple to put together. This recipe requires an overnight marination, but I just marinated the chicken about 8 hours or so. There are only four ingredients for the marinade and I only made half the recipe. Baked it for about an hour and the chicken turns out moist and tender. My kids love it, they love anything with honey! But this is not for me. Even my hubby says it is OK but not that great either. I find that somehow it lacks, a certain ingredient, as all I can taste is just the sweetness of the honey. I did add on the ginger and soy sauce as I feel that the flavours does not come through. I thought that by baking with the chicken, it would be tastier with the taste from the chicken, but even though the chicken itself is moist and tender, the marinade is just lacking of something. Sorry, Ina, this is just not for me! I did thought of adding in some Worstershire sauce and a dash of hot sauce, when I tasted the marinade, before I pour it over the chicken, but decided against it and go for the original instead. Anyway, for those who would like to give this a try, here's the recipe which can also be found at Food Network's website. The reviews at Food Network are outstanding, and that is one reason enough for me to try this out. Maybe I did not do it right, but I don't think that I'll be making this again, even if I do, I'll go easy on the honey and add on another ingredient or two. Cook the honey, soy sauce, garlic and ginger root in a small saucepan over low heat until the honey is melted. Arrange the chicken in 1 layer in a shallow baking pan, skin side down, and pour on the sauce. Cover the pan tightly with aluminium foil. Marinate overnight in the refrigerator. Place the baking pan in the oven and bake for 30 minutes. Uncover the pan, turn the chicken skin side up, and raise the temperature to 375 degrees F. Continue baking for 30 minutes or until the juice run clear when you cut between a leg and thigh and sauce is a rich, dark brown. (Halfway during marination, I turned chicken halfway, skin side up, and before baking, turn it back again, skin side down). Jamie uses broccoli and I add on the carrots as I only have a small head of broccoli. The Asian dressing is really nice, I did not add any sliced fresh onions, but I think that it would be really good and would be a lovely Asian touch! Get yourself around 1-1/4 pounds of broccoli or broccolini or broccoli rabe. Heat your steamer pan or put a large pan of water on to boil. Break the broccoli up into little pieces and slice up the stalks. Place the broccoli in your steamer or in a colander placed over the pan of boiling water and cover with a tight-fitting lid or some aluminium foil. Steam for around 6 minutes, until the stalks are tender. Meanwhile, make your dressing. Peel a thumb-sized pieces of fresh ginger and a clove of garlic and grate into a bowl. Halve, seed, and finely chop a fresh red or green chili and add to the bowl. Stir in 1 tablespoon of sesame oil, 3 tablespoons of extra virgin olive oil, 1 tablespoon of soy sauce, and the juice from 1 lime. Drizzle in a teaspoon of balsamic vinegar. Whisk the dressing together and have a taste. What you're looking for is a flavour balance between saltiness from the soy sauce, sweetness from the balsamic vinegar, acid from the lime, and heat from the chili. When the broccoli is cooked, place it on a big serving platter. Mix up the dressing one last time before pouring it over. Absolute heaven! This is the first time that I've tried making pudding and it is an experience I will remember, or rather, I would not forget! For our third Bake-Along, Lena of Frozen Wing and Zoe of Bake For Happy Kids and myself, have decided to make Butterscotch and Hazelnut Pudding, so I was really looking forward to this. I was reading through the recipe and pictured this pudding as something like a steamed cake, with some butterscotch caramel as the topping, sounds yummy! My six ramekin moulds could not fit into my square deep cake pan, only 5 could fit into it. Clever me, I checked! So I reduced the recipe to only 3/4 from the original. I made the butterscotch caramel and divide the caramel among the 5 ramekins, and place the ramekins in the square deep cake pan. Then I place the cake pan in the refrigerator, just as instructed. So far so good. Next, I mixed the batter, took out the cake pan from the fridge and divide the batter among the 5 ramekins, about 3/4 full. There was some extra batter, enough for another ramekin and I thought that I would bake that as a mini cake instead, perfect to place next to the cake pan in the oven. So into a cute little cake pan, the extra batter goes. So far so good. I then boiled some water in a small kettle and pour the boiling water into the cake pan where the 5 ramekins are placed. The water is not enough to come halfway up the sides of the ramekins. So I turned away for half a minute to pour more boiling water into my little kettle. When I was about to continue on pouring the hot water into the cake pan, I noticed that my counter was wet! Oh no! The water was flowing out from the four bottom corners of the cake pan. Gosh! Gosh! Gosh! My baking pan has joint corners and the water is seeping out from these corners. Not so clever me now! Never thought about this! Quickly clean up the mess, careful, water is hot! Need to change to another baking pan with no joint corners! The one I had is smaller and can only fit in 4 ramekins. I need another smaller baking pan with no joint corners! Used my loaf pan and that can fit in two ramekins. Put the fifth ramekin in. The extra batter in the little baking pan could not fit into it! Urgh... So I scraped the batter from the cute little baking pan to the sixth empty ramekin. Place that into the loaf pan. Fill it with water, wrapped both pans with double-layers of aluminium foil. And finally into the oven! Never had this much fun baking in quite a while! LOL! Baked them in the oven for about 45-50 minutes. Baked pudding just out from the oven. Turn it out into a serving plate. Looks kinda flat, doesn't it? The butterscotch caramel seems tasty enough but it is a little too thick, I would have preferred it to be a little more runny. And it is a little too sweet for me! The pudding itself is moist and good. My kids enjoyed it thoroughly and have requested me to make this again! ??? We did finish all the six puddings in day one itself! Let's hop over to my baking buddies, Lena from Frozen Wings and Zoe from Bake For Happy Kids, and see their Butterscotch and Hazelnut Pudding. Place the butter, sugar, eggs, vanilla, flour, baking powder and milk in the bowl of an electric mixer and beat until well combined. Divide the mixture between the ramekins (6 x 1cup capacity). Place the pudding in a water bath. See *. Cover tightly with 2 sheets aluminium foil and bake for 45 - 50 minutes or until the puddings are springy to the touch. Remove puddings from water bath and invert onto plates. Serve warm with vanilla ice-cream or cream, if desired. Makes 6. * To make a water bath, place the puddings into a deep-sided baking dish and pour in enough boiling water to come halfway up the sides of the ramekins. This will ensure the puddings are cooked evenly. We had a Father's Day dinner at a Japanese Restaurant but our dessert at home! Made this Zabaglione Ice Cream Torte. No ice cream maker is needed to make this. You just need to be patient over the stove, with an electric hand-held mixer! Put the biscuits in a strong plastic bag and crush finely with a rolling pin. Tip into a bowl and stir in the apricots and melted butter until evenly combined. Make the ice-cream. Put the sugar and water in a small, heavy-based saucepan and heat, stirring, until the sugar has dissolved. Bring to the boil and boil for 2 minutes without stirring. Meanwhile bring a large saucepan of water to simmering point. Put the yolks in a heatproof bowl to fit over the pan without touching the water. Off the heat, whisk the egg yolks until pale, then bowl gradually whisk in the sugar syrup. Put the bowl over the pan of simmering water and continue to whisk for about 10 minutes or until the mixture leaves a trail when the whisk is lifted. Remove the bowl from the heat and carry on whisking for a further 5 minutes or until the mixture is cold. In a separate bowl, whip the cream with the Madeira or sherry until it stands in peaks. Using a large metal spoon, fold the cream into the whisked mixture. Spoon it into the biscuit case, level the surface, cover and freeze overnight. To make the compote, simmer the apricots and sugar in the water until the apricots are plump and the juices are syrupy, adding a little more water if necessary. Serve the torte in slices with a little of the compote spooned over each portion. Simple and yummy bowl of pasta in tasty chicken soup. Perfect for lunch! This recipe calls for the zest and juice of 1 lemon, which I omitted. I just want the delicious taste of the chicken soup without the addition of sour lemon. For the pasta, I just mixed some Elbow Pasta with Vegeroni Shapes Pasta. This is a simple, yet satisfying lunch. In a sauce pot, combine the chicken, halved onion, garlic, bay leaf, and enough water to cover. Bring to a boil, then lower the heat and simmer gently until the chicken is cooked through, 15 to 20 minutes. Meanwhile, in a soup pot or Dutch oven, heat the EVOO over medium heat. Add the chopped onion, carrots, and celery, season with salt and pepper. Cover the pot and cook until the vegetables are softened, about 8 minutes. Add the chicken stock and bring to a boil. Remove the poached chicken from the liquid and add about 2 cups of liquids, poured through a strainer, to the soup pot. Dice the poached chicken, then stir in the egg noodles, add the chicken, and simmer for 5 minutes. Turn off the heat and stir in the scallions, parsley, dill and lemon zest and juice. Season the soup with salt and pepper to taste. No-Fuss Focaccia, is really no fuss at all! It is extremely easy and quick to put together, and you'll be enjoying it within two hours! And it is really tasty and good! Found this recipe from King Arthur's Flour, don't you just love this fabulous site, I do! I made this twice actually, the first time we had it on its own with a cup of tea. It is really tasty and good enough to eat it as it is. The next day, I made it again, this time we ate it with a can of Campbell's Mushroom Soup. Simply dip into the hot soup, Yummy! This bread is best eaten on the day it is made. Super easy to make. There's NO kneading! Just mix all ingredients in the cake mixer, after about a minute, the dough which is actually very soft and sticky, is placed in a greased baking pan. Cover with plastic wrap, make sure you grease the plastic wrap well. Leave it in a warm place to rise for about 1 hour. After about an hour, it will be puffy and nice. Make indentations all over with your fingers and drizzle lightly with some olive oil all over and in the indentations. Sprinkle with any dried herbs you like, I use Pizza Seasoning, and bake in the oven for about 35-40 minutes. Simple, isn't it? Delicious smell from the oven when it is baking! Leave it for 5 minutes in the pan after baking, and turn out to a wire rack to cool. We eat it warm (couldn't wait! ), really good! I'm submitting this to Aspiring Bakers, hosted by The Sweetylicious where the theme for the month of June is "Bread Seduction". The Sweetylicious is giving away a cookbook to one lucky entry! Visit The Sweetylicious for more details of the giveaway! Good luck! While the dough is rising, preheat the oven to 375F. Bake the bread till it's golden brown, 35 to 40 minutes. 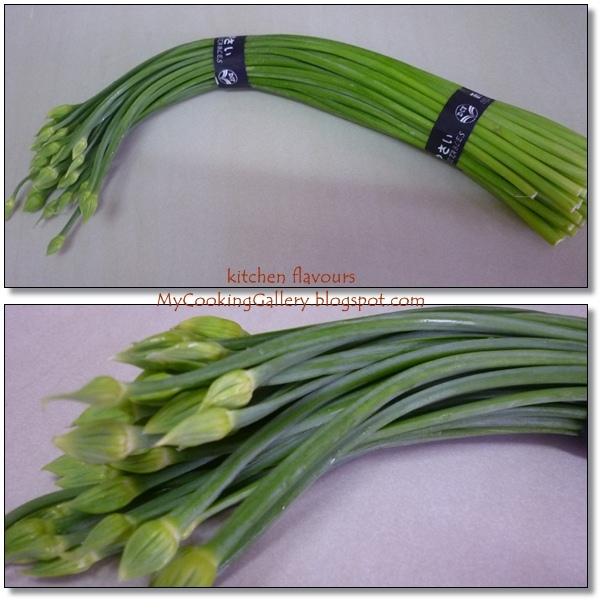 Flowering Chives (gow choy fah) are really popular among the Chinese. I love eating this veggie, it has the smell similar to chives but unlike chives where the stems are flat, these Flowering Chives has an almost triangle-liked shaped with hollow stems. They are great in stir-fries and goes well with prawns and meat. The flowers are edible and the stems are sweet. They are delicious in stir-fried noodles too. I cooked this really simple and tasty dish for dinner a couple of days ago. Flowering Chives are stir-fried along with Prawns and Tofu. Two pieces of firm tofu, rinsed and pat dry. Slice each piece in half horizontally to get two slices from each piece of tofu. Fry with some oil over medium heat until light brown. Dish out and drain. Tofu are sliced to smaller pieces after frying, Flowering Chives are sectioned to about 1-1/2" to 2" lengths, and the prawns are marinated. One of my family's favourite veggie dish. Give this a try, I'm sure that you will like it! Rinse and pat dry firm tofu. Slice horizontally in half. Heat about 2-3 tablespoon oil in wok or skillet. Fry tofu on both sides till light brown. Dish out and keep aside to cool. When cool, cut each slice in half and cut each half into four, making a total of eight pieces for each slice. Repeat with remaining slices of tofu. Keep aside. Peel prawns, leaving the tail intact. Devein, rinse and drain prawns. Marinade prawns with oyster sauce, white pepper powder and sesame oil. Keep aside. Wash and drain Flowering Chives. Cut about 2" from bottom stalk and discard (usually the bottom stalk will be hard and tough, if it is young and tender, then omit this step). Cut the Flowering Chives to about 1-1/2" to 2" sections. Keep aside. Heat about 2 tbsp oil. Saute the chopped garlic until light brown and fragrant. Add in the prawns, stirring for about 2 - 3 minutes until prawns are almost cooked. Add in the flowering chives and 2-3 tablespoons of water. Add salt to taste. Stir for another 2 - 3 minutes. Add in the tofu pieces and Chinese cooking wine (if using), stir for about 10 seconds. Dish out to a serving plate. Serve hot. Enjoy! This dish is excellent with or without the Chinese cooking wine. The wine adds a light taste and aroma to this dish. What a delightful name, Citrilicious Cake! This cake has the flavours of three different citruses. Oranges, lemons and limes! I just love citrus! Don't you? Just as the name sounds, this is delicious as in citri-licious! The cake is moist, soft and all the citrus flavours in one cake! When I read that the recipe calls for only 3/4 cup sugar, I was totally surprised, as most recipes usually calls for at least 2 cups of sugar and I would always reduce the amount of sugar calls for, but not for this. The sweetness for me is just right. This is my kind of cake! The citrus buddies ; oranges, lemons and limes. Seeing that the amount of sugar should be just right, I went ahead with the glaze. I'm glad I did. I only did half of the lemon glaze recipe as I wanted to drizzle on the cake, not coat the cake completely. The sweet lemony glaze goes well with the not-too-sweet cake. If you really like your cake sweet, then I would suggest to make the full glaze recipe and completely coat the cake instead. The orange, lemon and lime zest all in a slice of Citrilicious Cake. Good with a cup of tea. I had mine with warm Chinese Tea. * The natural extracts are optional but will intensify the citrus flavours of the cake. Sift flour and baking powder and salt together. Set aside. Transfer batter to cake pan, that have been coated with a baker's cooking spray that includes flour (or greased and floured), filling until cavity is about 3/4 full. Invert cake onto a cooling rack or serving plate. If cake resists, cool in the pan for 15 minutes before inverting. (If cake still resists, cool an additional 15 minutes in the pan). Cool completely before frosting, at least 1 hour for a big bundt. Put sifted powdered sugar in a small mixing bowl. Using a whisk, add lemon juice to powdered sugar, 1 tbsp at a time until sugar is completely dissolved and mixture is just thin enough to pour over cake. (my notes : I just make half of the glaze recipe to drizzle over cake. If you want to cover the whole cake, then make full recipe). Chocolates For Breakfast, Yum! Yum!